I've waited for the new Delain album, 'April Rain,' with eager anticipation. Now that it's crossed my desk and traveled through my ears, I'm beginning to wonder why I was making such a big deal about their sophomore release. Sure, 'Lucidity' was awesome, declaring Delain the heir apparent to Nightwish as the latter fumbled for direction after Tarja left. If you long for the last days of Tarja-era Nightwish, then Delain's 'April Rain' will certainly not disappoint. Otherwise, nothing much has changed here. Yet, with these fine bravos, 'April Rain' still posed a dilemma for me. There is nothing new here; there is nothing that distinguished Delain from the massive pack of other bands in the genre. Ironically, the best songs on the album, 'Control The Storm' and 'Nothing Left,' feature Marco Hietala of Nightwish (without the growls). What's going on here? Is this a nod to forbears and peers, or simply a need for approval from the same? I'll give you a moment or two to ponder that. With this said, and to further the dilemma, I truly enjoyed this work. It may not be in my current rotation for long, but it was satisfying like that first cup of coffee brewed from your favorite brand first thing in the morning: pleasing, but redundant. To conclude, Delain's sophomore effort 'April Rain' only demonstrates that they have found and are securing their position as the premier second generation symphonic heavy metal band. Essentially, Delain has become the new Nightwish without the nightmarish ear-splitting vocals. What the do, they do well. But we've heard it before. 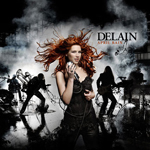 Delain's sophomore effort 'April Rain' only demonstrates that they have found and are securing their position as the premier second generation symphonic heavy metal band. Essentially, Delain has become the new Nightwish without the nightmarish ear-splitting vocals. What the do, they do well. But we've heard it before.